SuperWOW!!! Can't wait for the full pack!!! 1.If a program is running eg. Ner@ and if i click to search then in that small window the switched icons(yours) arent there...maybe the resolution causes it? 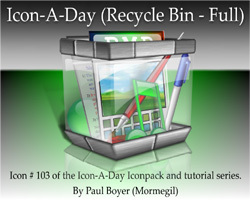 2.Can i make such iconfiles (.ico,.png) with 3DSm@x? I have not made Icons with Max, but I know many people have. I cant help you with how. Im not quite sure of what you are asking about search? Hmmm...maybe its caused by the iconpackager. But i can send u a screenshot if u still dont sure what i said. Oh right H0lySh1t I know what you mean. It's the open/save dialog. Windows (Iconpackager) sometimes does not change the icons in there so if you want the proper look you'd have to reshack shell32.dll and replace each icon with the ones in the pack (altho the folder is the one that sticks out). Hope that helps and I know a very late reply. rar is broken? same with the empty version?